Polyester clothes sometimes get a bad rap but polyester fibers are an important part of the fashion world. Microfiber and high-performance athletic wear often contain polyester fibers. And, the addition of polyester to cotton fabrics revolutionized easy-care clothes: no more ironing! Polyester fibers are insect resistant, durable, resilient, and can be woven or knit into many weights and textures. Polyester is an easy-care fabric if you remember to wash in warm water (never hot), use a good detergent with enzymes that will break up stains, and avoid high temperatures when drying or ironing. All synthetic fibers are heat sensitive and high temperatures in the dryer or when ironing can cause them to melt, shrink, or deform. If you use the hot water setting on a washer, the heat and finally spinning action can create seemingly permanent wrinkles in polyester. Steam pressing can sometimes remove these wrinkles; but the high heat required from the iron can also cause melting, shrinkage, and create holes. It is important to use the correct temperature when ironing polyester. 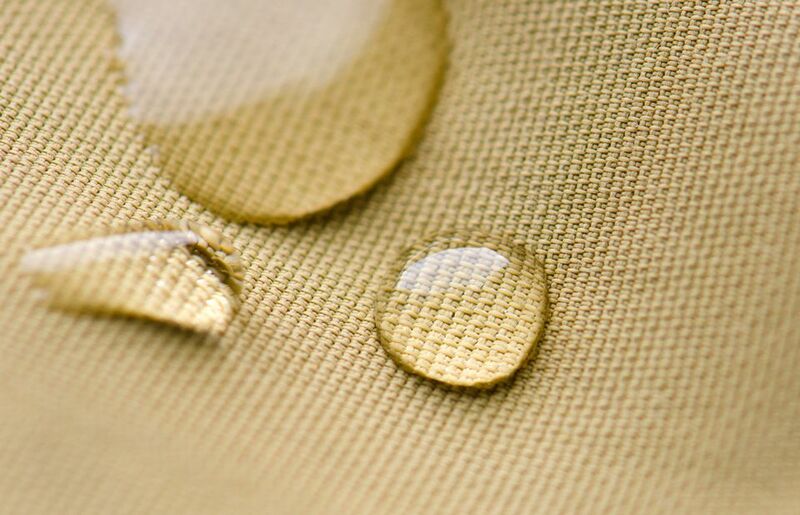 When an oily stain comes in contact with polyester fabric, the attraction is solid and difficult to break. However, oil stains are easily removed if treated immediately. Pretreat with a stain remover and then wash in warm water with a heavy-duty detergent like Tide or Persil that contains enzymes to break apart the oil. Always check that stains are gone before placing polyester clothes in the dryer. Heat will set oil stains and make them almost impossible to remove. As with most fabrics, white polyester clothes can become dingy and even yellowed. Even bright polyester colors can become dull due to dye transfer from other fabrics or detergent or fabric softener residue left in the fibers. The key to brightening and whitening polyester is to NEVER USE chlorine beach. Chlorine bleach damages polyester by stripping away the outer coating and revealing the yellow inner core. White garments will actually turn even more yellow. Instead, opt for oxygen bleach and warm water. Mix enough water and oxygen bleach solution following package directions to completely submerge the fabrics. Allow the dingy clothes to soak in the solution for several hours and then wash as usual. One of the biggest selling points of polyester is its non-wrinkling qualities. However, if polyester does become heavily wrinkled or creased, it can be very difficult to remove the creases without damaging the fabric. So, an important care factor is to prevent severe wrinkling. Follow these tips to ensure the fabric continues to look good. Do not overload washer, clothes should move freely. Use cold or warm water for washing and rinsing. Dry clothing using the permanent press setting on your dryer. No high heat. Remove clothing immediately at the end of the cycle and do not overdry. Hang garments on hangers after drying to allow wrinkles to relax and fall out over a few hours. You can thank British scientists John Whinfield and James Dickson for the development of the first polyester fiber, Terylene, in 1941. Their work was inspired by the discovery of DuPont scientist, W.H. Carothers, the inventor of nylon, who found that alcohols and carboxyl acids could be successfully mixed to create man-made fibers. The name comes from poly (meaning many) and ester (a basic organic chemical compound). Ethylene, which is derived from petroleum, is the main ingredient in the manufacture of polyester. This can be distilled from oil or recycled from previously manufactured plastics. Following the end of World War II, DuPont bought the rights to manufacture polyester and the rest is history. Today, more than fifty percent of the world's clothing is made from polyester and you'll find polyester fibers in nearly every category of fabric from sheer tulle to heavy upholstery and carpets. The manufacturing method determines the form the finished polyester fibers will take: filament, staple, tow, or fiberfill. Filament is a continuous strand that can be woven or knit into a smooth-surfaced fabric of varying weights. Staple fibers are created by cutting the filament into predetermined short lengths. These fibers can then be combined with other fibers to create blends like poly-cotton that incorporate the good qualities of both fibers. Tow polyester is made from continuous filaments that are drawn loosely together. Tow produces a heavy, rope-like fiber that can be left long or cut into shorter lengths for carpet. Fiberfill is very thin, short lengths of fibers that create the fluffy, voluminous material used to fill pillows or provide insulation layers in bed linens and outerwear.